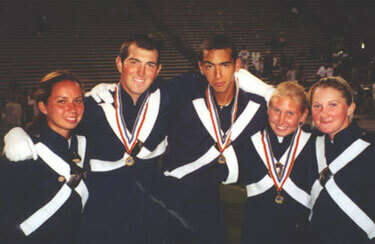 This picture is from Alana Fredrickson, a Blue Stars member from 1997-2002 and 2004. This is a picture of 5 out of the 17 people that stayed at my house during the summer of 2000. Out of the whole bunch — Kim, Kevin, Natan, Lea and myself — were the closest. It was Kevin and Natan's first year marching, but us girls had a couple of years underneath our belts. We had an amazing summer together and truly became one crazy and wacky family.